I have just found out that the final parts of the documentary series "Kingdom of Yugoslavia in WW2" - which I've mentioned here before - have been finalized and posted, completing the 18-episode project. According to executive producer Miloslav Samardžić, the trailer for episodes 13-18 has been posted on Vimeo, where the entire 18-episode run is up for purchase or rent. It took the Kragujevac-based Pogledi and the society of former Royal Yugoslav Army soldiers in the UK nearly four years to crowdfund and produce the series, which shows the previously untold story of the war in Yugoslavia. The first twelve episodes were offered to the Serbian Radio Television (RTS), which was supposed to reply by the end of May but has yet to do so, Samardžić said. He says the series shows a much-needed alternate perspective to the movies glorifying the Communist Partisans, which are currently being shown on RTS in re-runs. "Our story isn't made up," Samardžić said, adding that buying or renting the series on Vimeo will support the producers' new project, a 90-minute documentary "General Draža Mihailović." Why there is no article or comment yet on the death of Helmut Kohl? "Illegal German Weapons to Croatia and Bosnia Fuel the Balkan Conflict"
"The chancellor praised the fact that NATO's bombardment against the Serbs had an effect on the Serbs, "has something to do with my influence."" 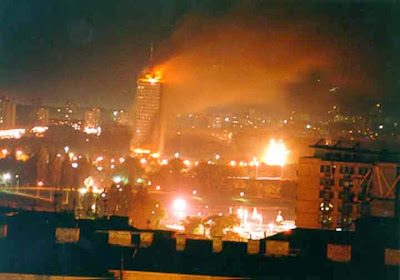 The destruction of Yugoslavia and genocide against the Serbs was so important to him that he rushed a bill for the illegal NATO attack against Yugoslavia on his last day as chancellor in 16.10.1998. @cubucoko off topic - don't you have the sense "fake news" is being dissiminated through Greek and other (Serb and international) media regarding the incident on the island of Zakynthos using "anonymous sources"? Like the attack being a hate crime and Bakar protecting the Serb girl?! WTF?! I looked closely at the CCTV footage, albeit not really clear, but it appears to me the girl was making a selfie with a white guy, while Bakar was merely a part of the group at the table, it appears he forcefully grabbed her, she like pushed him off forcefully, then a Serb interfered and the Serb got hit first by Bakar. But in the pro-globalist media (including Greek and Serb) they have turned it the other way around. It seems to me the incident is being politicised like everything else had been against Serbs from the 1990s until now. Cubucoko, do you feel the same? Balkaninfo, I noted Kohl's passing on Twitter, but then got busy with my (fairly demanding these days) day job. Thanks for the reminder and the sources. One of these days I'll make a retrospect about Germany's role in breaking up Yugoslavia not once, but twice (1941, 1991), since that tends to be glossed over in the torrent of fake news blaming the phantom "Serbian imperialist nationalism" for everything. I'm looking forward to your article. The leading role of Germany (and especially of Kohl and the former nazi party member Genscher that died last year) in the destruction of Yugoslavia is almost never mentioned in the media, although Kohl did not bother to hide it. In 24.9.1998 German state TV even reported on how Germany illegally armed KLA terrorists with anti-tank weapons. But in the antiwar movement this is almost completely ignored. It seems to me that most people prefer to ignore the fact that Germany pursues an imperialistic and revanchist foreign policy like during WW1 and WW2. It seems incomprehensible to them that Germany does not want to learn its lessons from two lost world wars. Despite its repeated wars of aggression, genocides and revanchism according to international polls Germany is "the most popular country" in this bizzaro world. Already in 1848/49 when there was no German Reich German imperialists wanted to occupy and colonize Southeast Europe and prevent any Yugoslav state. This German colonialism and warmongering (still) is driven by centuries-old anti-Slavic racism and economic interests. "outwards it is essential to achieve something whereby we have failed twice before"
"Maintenance of free world trade and the unchecked access to markets and raw materials all over the world"
"Without Germany it is impossible to integrate the East European peoples." "The Hegemony over Southeast Europe"
The nazi-run BND supported the Ustashe since the 60s and the UN Special Envoy Cyrus Vance called it: "Genscher's war"
"The views of the Paulskirche delegates were marked by the convincing prevailing in the German principalities, according to which nature had determined "the Slavs" to be slaves and slaves and not rulers. Since the tenth century, this view had been traced and consolidated since the German conquest and colonization of large parts of East and South-East Europe. The subjugation "of the Slavs by the Germans" was regarded as legal and natural (Wippermann 1981: 38). The "Slavs" were denied the ability to and the right to statehood. The "German cultic process" was called to their leadership (Lammich 1978: 3 f., 19)." Just as in List, the countries of East and South-East Europe were given the role of suppliers of raw materials and agricultural products by the deputies, while the German Reich was to export finished products there, thus establishing a classical imperialist dependency. And then Germany would have the "wedge and hammer" at the same time to penetrate between the North and the South Slavs , And to develop the German banner on the Black Sea coasts. (Stormy Bravo on several sides) "(RfdN, Vol. 6: 4860). Here, in a concentrated form, the essential aims of the later German East and South Eastern Europe conception are: the endeavor to colonize East and South Eastern Europe by German emigrants; The interest in raw materials for the German wood and textile industry and the South-East European ore-that is, metal deposits; The interest of driving a wedge between the North and the South Slavs, that is, the population of Eastern and South Eastern Europe; And the strategic and commercial policy objective of German access to the Adriatic and the Black Sea. On March 25, 1848, the National Assembly in Agram (Zagreb) elected a joint governing head for the territories of Croatia, Dalmatia and Slavonia (Valentin 1977, Vol. 1: 549). This development was regarded with suspicion in the German principalities and Austria. The anti-Slavic or anti-Russian mission"